Elementals is a 5 reel and 20 payline slot by Microgaming. The slot story surrounds 4 elemental spirits namely Undine, Slamander, Gnome and Sylph to represent the four natural elements of earth, wind, water and fire. Game symbols appear to have popped out of a comic strip. The reels are set on a purple background and other than the Elementals, there’s also a bunch of fruit symbols here al designed as cartoons. Microgaming is one of the oldest online casino software providers in the industry. The company was formed in 1994, an age where the online betting revolution was still a little ways down the road. They have wide experience in the knowledge having started off with classic slot games and then later started converting their games to HTML5 format to make them more mobile compatible. The good thing about being in the industry for a long time is that you have a wide range of slots, table games and more for players to choose from. Microgaming has 600 different games on offer, 300 of them being slots. They’re also known for producing quality table games which have amazing 3D graphics to make players feel like they’re literally transported to a physical table game. The game features cartoon designed symbols e.g. oranges, cherries, guava, a buff man, watermelon, the elementals, a wild and scatter symbol. Wild symbol- It is represented by the word ‘wild’. The wild can replace any other symbol on the reels except the trigger and scatter. All the wins with a wild substitution are doubled. The wild symbol is also able to form its own winning combinations and wilds award 5000 credits. Scatter symbol- The scatter is represented by a Crystal Ball and can also form its own wins. All of the wins are multiplied by the total number of credits stake, and they are added to the pay-line wins. Free Spins- The letter 'E' in the Sun activates the free spins. The free spins are activated when you hit this symbol on any position on the reels. Once it starts, you receive 20 free spins and all the wins during the feature are doubled. It’s possible to reactivate the feature. Gamble feature- Players have the chance to gamble their payouts after every win. It’s very risky because if you make a wrong guess, you could lose everything. You will need to make a correct guess on the next card colour for a chance to double your win. 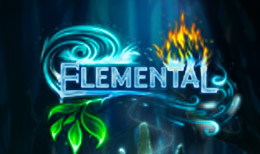 Elementals slot’s main goal is to give you a good dose of fun. The game is extremely simple without too many features. It’s probably most suitable for the punter who isn’t looking for anything too complicated in their slot. The best way of getting the most from this slot is to activate the free spins feature which starts you off with 20 free spins.